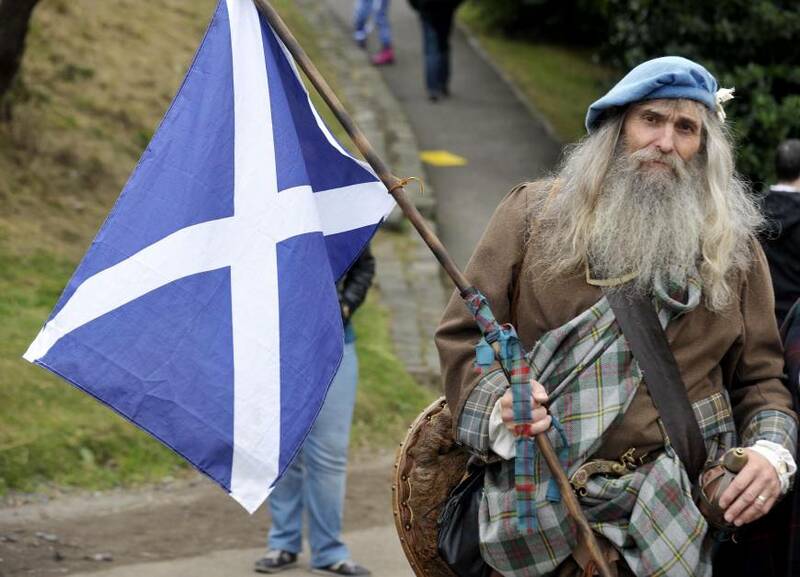 With global attention now turned to the referendum on Scottish independence, it’s worthwhile to recall that the cause has a much longer history, predating the 1707 Acts of Union; regardless of the outcome of the current vote, it will certainly continue. The Scottish National Party succeeded in getting a referendum on the country’s future largely by focusing on that demand over decades, pursuing multiple strategies to stay relevant, building inroads in mainstream political institutions, and taking advantages of opportunities, including political errors by its opponents. 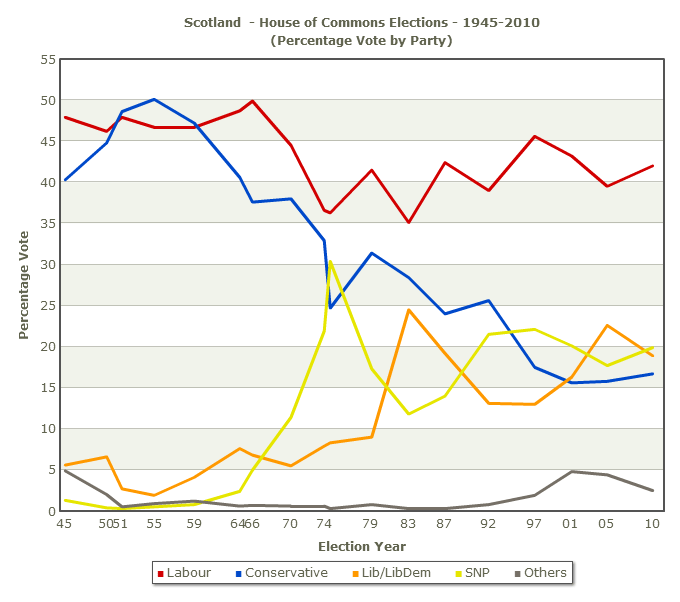 The SNP has been competing in UK parliamentary elections since the 1930s, and it’s NEVER done very well. The best showing, in 1974, was just over 30% of the vote, but the single member district system meant that this translated into just 11 of 650 seats. More recently, the SNP has posted roughly 20 percent of the vote in Scotland, never winning more than 6 seats, and Labour has consistently won the unicorn’s share of Parliamentary seats in Westminster. The SNP has performed a little better in lower profile European Parliament elections, trending toward 30 percent of the vote. Winning seats, even just a few of them, is a big benefit for a movement campaign. Members of Parliament have salary, status, staff, and some access to media. Since first winning a seat in Parliament (1970), the SNP has used these resources to emphasize the political (and geographic!) distance between Westminster and Scotland and to press its alternative. Parliamentary representation means that the SNP had paid professional politicians to make this case. The modern Scottish parliament first held session in 1999, its charter the result of a referendum supported by a Labour government in Westminster. At first Labour was the largest party, but the cause of Scottish nationalism–and the electoral fate of the SNP–advanced in opposition to Conservative governance in England. It was aided by a hybrid electoral system which combined district representation with proportional representation. In 2011, the SNP won an outright majority of seats, gaining a stronger platform for advancing the cause of independence. Opponents could have clearly been smarter in crafting a response. David Cameron’s Conservative government agreed to allow a referendum on Scottish independence, which was framed as an either/or choice. Prime Minister Cameron was confident that union would triumph handily, affording him complete latitude in dictating any terms of devolved political powers to the Scottish Parliament. In retrospect, this was an obvious mistake. The SNP had asked for a third option on the ballot: increased autonomy for Scotland within the UK. It’s hard to imagine such a three part choice generating anything but ambiguous results. Cameron was greedy for a complete victory. As virtually all commentators have noted, Cameron was particularly bad at campaigning for union; every time he spoke, support for independence grew. I think John Oliver, below, is particularly entertaining on this. Now conventional wisdom holds that regardless of how the vote turns out, Cameron’s government will have to grant more autonomy to Scotland than even the more optimistic SNPers had initially hoped for, and Cameron’s own political future is in severe jeopardy. For Politicsoutdoors, there are lessons not only about the extraordinarily slow pace of change, but also about a movement’s using elected office to build a movement, and about the gains that can come from exploiting opponents’ mistakes. Sometimes just persisting–to be around when those opportunities and mistakes occur–is the critical component to victory. This entry was posted in Uncategorized and tagged European Parliament, John Oliver, nationalism, proportional representation, referendum, Scotland, Scottish National Party, single member district, United Kingdom. Bookmark the permalink. Well written and informative article. I do hope for a nationalist victory. Not looking likely at the minute. Hopefully there will be many new powers for Holyrood as a result of this vote though.